NO Registration Fee is charged for applying in the college. The starting date to fill the online admission form is 08/06/2018 and the last date to fill the online admission form is 29/06/2018. The Tentative merit list will be displayed on the college website on 30/06/2018. The Final merit list will be displayed on the college website on 05/07/2018. A candidate can select one or multiple course/class in single admission form. At the time of counseling, the candidate has to bring the hard copy of the online form. 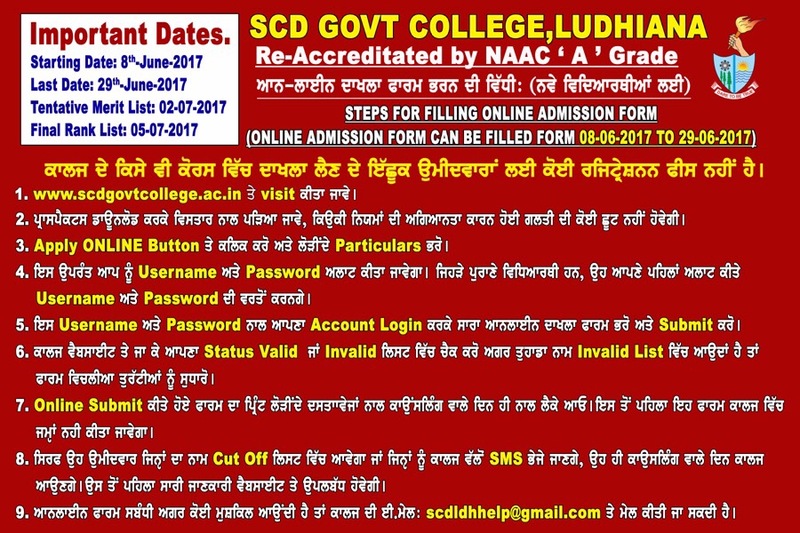 The hard copy of the online admission form is not required to be submitted in the college before the day of counseling. On the day of counseling, the candidates are required to submit all the necessary documents along with the online admission form. All the candidates applying in Reserve category will be automatically shifted in Open merit list as per their merit/rank. All the SC category students are supposed to fill the Self Declaration form, which is available at the end of the prospectus and download section of the college website. The students, who have passed 10+2 class from other state board except, ICSE, CBSE and PSEB must submit their originals certificates and Migration certificates before 31st August, 2018 in the college. The students who have got admission in M.A./M.Sc./M.Com./M.Sc. (IT) are required to submit their original certificates as well as Migration certificates if they have graduated from University other than PU Chandigarh before 31st August, 2018. In case of failure in submitting the migration certificate, admission to particular course is not confirmed by the Panjab University. If the admission committee confirms the admission, fee challan has to be generated. Requisite fees need to be deposited on or before the date mentioned in any branch of the SBI. In case of failure, the seat is deemed to be cancelled and next candidate from the merit list will be given preference for seeking admission. All the Students of B.A. and B.Sc. who have applied for options in subjects, will get the subjects as per the availability. All the students of any class of third semester and fifth semester will be provisionally admitted in case lower examination result is awaited. If in the lower examinations Student is fail in more than 50 percent of subjects, admission is deemed to be cancelled. For getting admission in M.A. (Geography) and M.Sc. (Maths), concerned subjects are required to attain minimum pass criterion at undergraduate level.